CAPTIVATING, INTRIGUING, BEAUTIFUL AND STRANGE, WHOGRAPHICA EXPLORES THE RICH UNIVERSE OF DOCTOR WHO LIKE NO BOOK BEFORE IT. 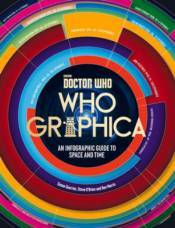 THROUGH CREATIVE VISUALISATIONS, INFOGRAPHICS, CHARTS, MAPS AND MORE, IT OFFERS A UNIQUE INTRODUCTION TO THE EXTRAORDINARY WORLDS OF THE SHOW FROM THE DOCTOR'S FAMILY TREE TO THE STRANGEST WEAPONS IN THE UNIVERSE; FROM A STAR CHART SHOWING THE EXACT CO-ORDINATES OF GALLIFREY TO A FLOW DIAGRAM OF ALLEGIANCES BETWEEN DALEKS AND CYBERMEN THROUGHOUT HISTORY.BURSTING WITH COLOUR, EXPERT KNOWLEDGE, AND FUN, WHOGRAPHICA WILL DELIGHT NEW AND LONG-TERM FANS ALIKE. AND, LIKE THE SHOW IT CELEBRATES, IT WILL MAKE YOU SEE THE WORLD IN AN ENTIRELY NEW WAY.